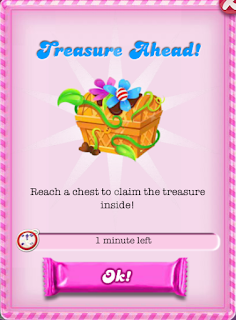 Candy Crush Saga All Help: Candy Crush Saga Treasure chests. Candy Crush Saga Treasure chests. How do the treasure chests work? When the treasure chests are available you will get this picture on the top right of the map page. 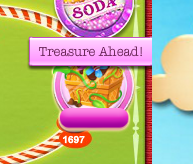 Click or tap on this and you will get this popup, which tells you how much time you have left to complete the task. The picture below says 1 minute, but it isn't correct as I had plenty of time to pass the levels needed. The treasure chests are on certain levels and you have to clear those levels to get the treasure. The chests are usually on the first, third and 8th level you have to pass. Once the popup appears just click OK to collect the rewards. Some players have informed us that the chests are sitting over the next level they need to play and preventing them from opening the level. If this happens you need to refresh the game and everything should be OK. The prizes are boosters and 2 hours of unlimited play. I had treasure chests on my pc and when I get to it nothing happened and I don't get the treasure! I refreshed and no help then I turned off and back on and now the treasure chests are gone! Anyone know about this or how it works? Thanks for contacting King Customer Care. I'm sorry you experienced this issue when playing. I have added an assortment of Boosters to your game and they will be available next time you play. Additionally, I'd like to recommend a few things to improve your experience with the King games. Taking these steps should ensure that you don't have any further problems with the game. d. As a last resort, try re-installing the game as it usually fixes most issues. Simply make sure before reinstalling that your game progress is backed up via Facebook. I'm also an iPad user. I've opened two treasure chests today, but I've only gotten the reward boosters ... no two hours of unlimited lives. But when I am playing, there is a time clock counting down beside my remaining lives count. The time on the clock does not match anything such as time left on treasure chests, special challenges or other King offers. I'm confused ... and a little annoyed I must say. My wife and I are on the same level. She gets treasure chest all the time and I've never gotten one. Why don't I get treasure chest? The treasure chests now have boosters but no free time. Is this something that was removed or a glitch? I am now on level 2099 and there was a treasure chest which disappeared once I started playing the game. I have also not been able to open treasure chests in previous games as they just disappear. I used to be able to open them but not for the last few weeks. Being such a dedicated high level player and having spent quite a lot on the game this is very disappointing. I have tried the suggestions but no luck. Help please. I'm on level 685, the last5 treasure boxes have not opened and it keeps starting me art level 655 So I have to manually advance. I've tried revving the app cache like mentioned above. I'm afraid of I reinstall it will remove all of the boxes I've earned. Help! I tried reinstalling it didn't fix the issues. How come the treasure from the treasure chest disappeared even though I hadn't claimed the prizes yet? Since I reached the 1700's I have not seen a treasure chest. Also, what is all this 2 hour free play about. I've never had that.